A meal for any time of the day - buttery and spicy and filled with proteins. Our very Anglo-Indian, Captain's Masala curry paste works perfectly - it should because this is what it's made for. 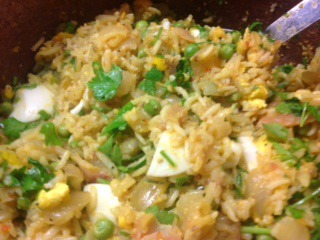 9When the rice is done add the fish, lemon juice, eggs, peas (if using) and the rest of the butter. Gently mix, add the parsley and serve.